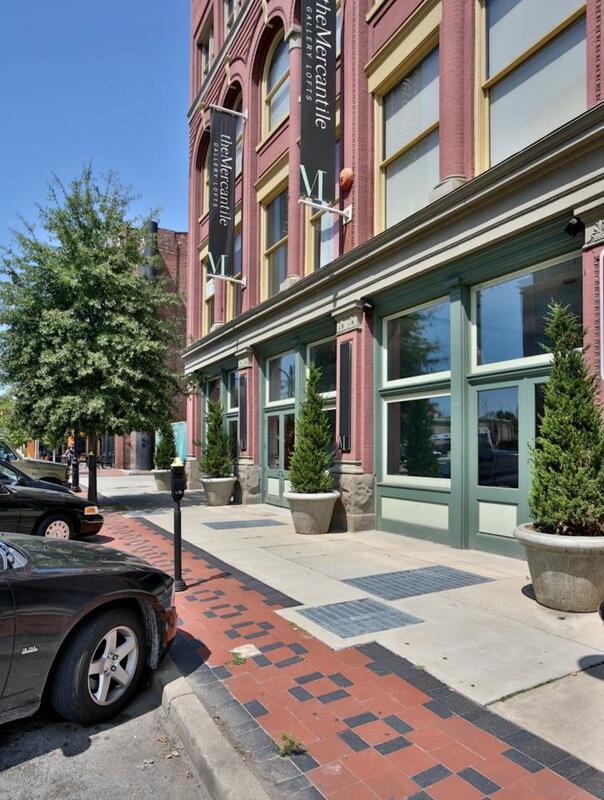 Breathtaking views right in the heart of the NULU district and Whiskey Row! Industrial living meets trend and convenience in the Mercantile Lofts! Originally a Hide and Trade company that began in 1889, the building has since been extensively remodeled and converted into luxury city living. You'll immediately be taken away by one of the few original factory doors that has been painted a vibrant orange and is mounted next to unit 408's entry. Enter in to a welcoming kitchen that includes stainless steel appliances, granite counter tops, beautifully stained concrete flooring, and 15 foot ceilings. The open floor plan offers tall windows with great views of the city Skyline and multiple layout options for positioning furniture.The bedroom is conveniently separated from the living space for privacy. The full bath includes an updated glass walk-in shower, floating shelves and a granite vanity. While the building offers a separate laundry facility, you'll enjoy the convince of en-suite laundry (the stack washer and dryer are to stay!). The fourth level of the building, has a ramped hallway so you can easily cart your groceries to your door and avoid any steps (carts may be used free of charge to residents). The covered, enclosed, and secured parking space is on the first level and is attached to the building for easy access. No need for a gym membership as this facility offers a full gym free to residence. The interior common areas include a library, billiards room, a catering kitchen, and a fire-side lounge that is perfect for entertaining your guests. Exterior common areas includes landscaped garden patio with furniture and gas grill. This unit includes 1 secured storage area in the basement of the building. Come see this pristine unit, you'll be ready to move right in! Listing provided courtesy of Wakefield Reutlinger Realtors. © 2019 Metro Search, Inc. All rights reserved.